On the day marking the 100th anniversary of the laying of the cornerstone in Webster Hall, Webster University was featured in two major feature stories that received international syndication. In The New York Times' education quarterly, Webster's study abroad program was prominently featured as an example of how the 21st century student receives a global education. "Erin McNellis, 21, did not travel far when she started at Webster University in St. Louis, where she also grew up. But she chose it because its international program would enable her to keep on traveling. Webster has campuses in seven countries, and partnerships with schools in seven more. 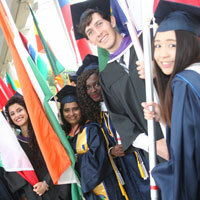 Students can study in Thailand, Ghana, China, Japan, Mexico and throughout Europe. About 20 percent of its students study elsewhere in the world; some never study in St. Louis at all. Students can spend full terms at Webster’s campuses abroad, and some courses combine an online or in-person class with an immersion trip; for example, a human rights studies class traveled to Rwanda and a class on international criminal law ended with a trip to Leiden, the Netherlands." Read the full article, with more quotes from McNellis, here. On Nov. 1, 1915, the Webster Hall cornerstone was laid and the Sisters of Loretto, representatives from the St. Louis Diocese and community members gathered to celebrate the founding with a small mass in what was then known as All-Saints Chapel. One hundred years later, on Sunday, Nov. 1, 2015, representatives of the same communities gathered in the same place (now known as Winifred Moore Auditorium) for an interfaith celebration of Webster University's centennial. With a number of other local options for prospective students to pursue, Stroble said Webster is more than happy creating different niches for itself. The article was also picked up by the Associated Press and appeared in outlets across the continent. Read the full story at stltoday.com.